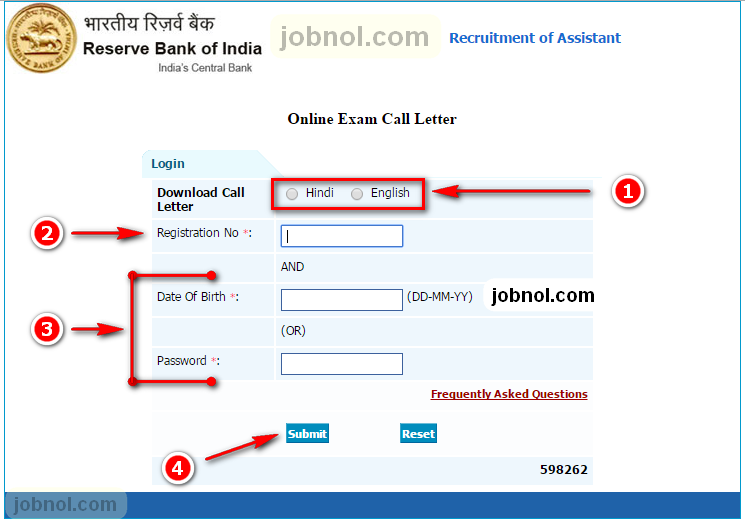 RBI Assistant Admit Card 2015; Reserve Bank of India recently enabled admit card downloading option for downloading Call Letters for Online Examination. Online Examination of RBI Assistant 2015 to be held in August 2015. Likely to be held on 1st August, 8th and 9th August, and 16th August. However RBI Reserves the right to change the dates of examination. 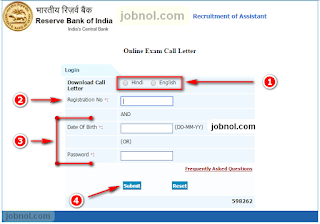 How do you download Call Letter/Admit Card for RBI Assistant Examination 2015 ? First you go to admit downloading link and then Select the radio button to choose the Language Version of Admit Card either Hindi or English. There after Put your Registration No in the appropriate field. Now Put your either your Date of Birth in (DD/MM/YY) or your password (sent to you via SMS/Email) and click on submit button to get your admit displayed. Now Print your Admit Card. If you ever wish to save your admit card the download it in PDF format. 0 Comment to " Admit Card of RBI Assistant Recruitment 2015 Examination - rbi.org.in "